This engaged couple are big football fans, the man having been a top wide receiver in college, and they enjoy occasionally tossing a football back in forth in their spare time. 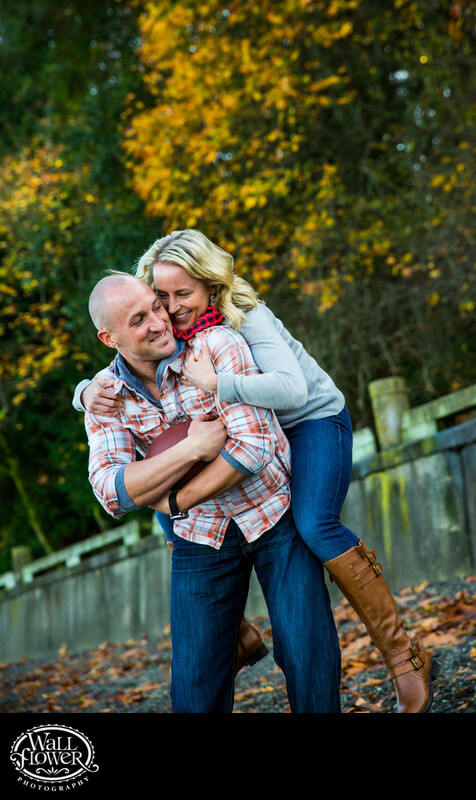 So it was natural for them to bring a football to their engagement portrait shoot at Point Defiance Park in Tacoma, Washington. We brought out the football while shooting down on Owen Beach, with yellow fall color in the trees and lots of brown maple leaves on the beach. The throwing and catching photos were fine, but this one out of a series of photos when she attempting to tackle her football-cradling fiance was the best.